The Supplier Reporting Plugin was devised to assist with real-time reporting of user-defined data for suppliers. As such, the Supplier Web Service was created to implement this functionality. This document is an overview of the abilities of this application. In order to access the Supplier Reporting Website, the Supplier Web Logins should be setup for each user. This can be found on the backend in the Records menu. 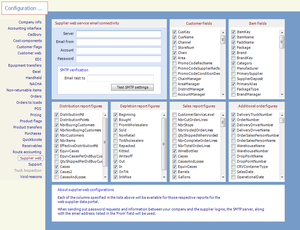 The Configure Supplier Web Panel is used to determine what information is accessible from the Supplier Reporting Website. To allow potential information to be viewed by the users, check the checkboxes. 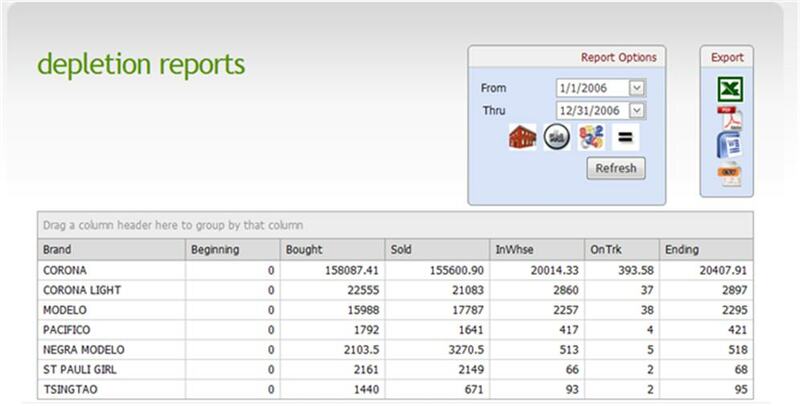 Upon successful login, there are three types of reports available - Sales, Depletion, and Distribution. To access these reports, simply click the titles on the top bar of the screen. Upon access there will be an empty screen, with the reports options. Using the images, the report may be built. When finished, click Refresh. It is possible to export these reports to Excel, PDF, Word (RTF), or CSV files. The data in the supplier reporting website is real-time. Meaning that the data is grabbed from the eoStar database directly; so, as soon as the distributor knows about it so does the supplier. This page was last modified on 20 September 2010, at 15:23.